Surrounding habitat is chaparral and mixed oak woodland. yeah, let's settle for Stenochidus cyanescens LeC. On Hartmut's suggestion, I have added a close-up in an attempt to illustrate the pronotal punctations. S. robustus is not only larger (~10.5mm) and more robust than either gracilis or cyanescens, but has more deeply impressed elytral striae. Re. the color of your beetle, lighting seems to be a big factor, but even in the present picture I detect some blue chroma. Better yet in the right-most image. Actually, there's some blue even in gracilis' elytra, though otherwise different. S. cyanescens used to be in the genus Prionychus. Take a look at the type at Harvard MCZ. This is where entomology meets art: even Ad Reinhard's black paintings weren't completely black, but usually used some chroma. This is best detected when comparing side by side. By the way - do I dare ask - do you still have the specimen? There's more but I don't have the time right now. Will get back later. ...specifically in regards to the characteristics of S. robustus. I agree that lighting may well be a factor in my images and I've just posted one more shot showing the beetle on the same white surface, but this time in the shade instead of direct sun. Again, it seems bluer to me than in my original submissions. I do not have the specimen, so I'm afraid these images are all we have to go on. "I looked in our reference collection and we have two of the species, but not the third. Your specimen of Stenochidus is not S. gracilis. It could be cyanescens, but all of my specimens are from the Sierra Nevada's down to just north of Tehachapi, and have a distinct blue cast to them." Hartmut, I'm curious if you have found anything on the stated range for S. cyanescens? ...a third image and fourth image to possibly show elytra coloration more accurately. probably Strongylium or related. Will search around BG for a bit and see if I can nail it down more. Sorry if this is an ignorant guess... I'm still kind of at the rudimentary phase of beetle ID, but thought perhaps there were some superficial similarities between my beetle and this Stenochidus specimen. Thanks for working on this one for me, Blaine! Stenochidus too, and Alleculinae is a definite possibility. It does not look like the Stenochidus on BG and I dont have enough experience with that genus to know about other spp. Maybe Vassili or someone else will chime in. 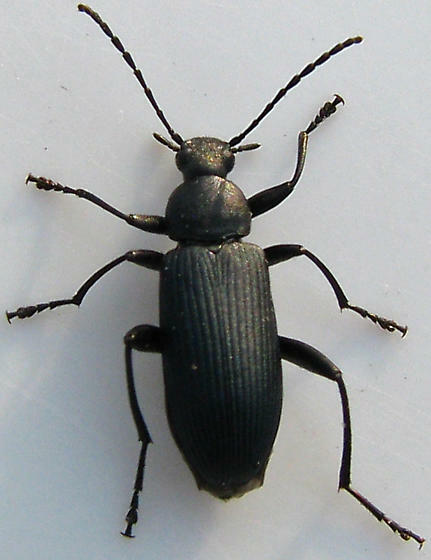 Well, according to the CA Beetle Project, there are two other possible species not represented on BugGuide -- S. cyanescens and S. robostus -- but obviously it could easily be something in an entirely different genus (or subfamily, for that matter). if it was a new species for BG! from when I looked up the Stenochidus I found 2 years ago aren't too helpful with this one. I'll see if I can check the specimens at the museum again.... Looks like Hartmut is onto this also. ...for any assistance you are willing to provide in looking at museum specimens. Thank you, Joyce! Does anyone know where the original description or key is for the three Stenochidus species? Without something specific to go on, the three species in the museum look very similar. Hartmut's statement of the "more deeply impressed elytral striae" on robustus seems true. But the sizes of the 8 specimens in the museum are quite varied -- some smaller than the larger gracilis or cyanescens specimens. S. gracilis specimens have more of a bluish tint on the elytra than S. cyanescens (whereas S. robustus is more black). Almost all the Stenochidus specimens at Essig were determined by James D. Marshall in 1964. It appears he studied alleculines through the 1980's and published some papers on them, including a key to genera of North America. S. gracilis - 47 specimens from CA counties ranging from Shasta Co. in the north to Los Angeles Co. in the south. the Essig specimens, thanks Joyce! S. cyanescens was first described (as Prionychus) by LeConte in 1859 from a specimen obtained at Fort Tejon (possibly by O. Dietz). Earlier, in 1851, LeConte had named gracilis under the genus Stenochia, the type specimen came from San Diego. S. robustus was described by Charles Schaeffer in 1911, at which time he also named a darker form of cyanescens var. carbonarius. Specimens of that form came from Tulare county. He described it as a "Form of cyanescens, but more elongate and parallel; upper surface black, legs and antennae brown or piceous; thorax less densely punctate than in cyanescens. Length 8.25-9mm." however, there's a difference in the relative length of the antennal joints, which are relatively shorter and the outer ones wider in gracilis. The form of gracilis seems to be also slightly shorter and a little more convex than cyanescens." This appeared in the J. of the New York Ent. Soc., 1911. The whole tome of 339 pp. can be downloaded (the pertinent pages on Stenochidus are 125-126) at Biodiversity Heritage Library. Marshall, J.D. 1967. Synopsis of Stenochidus LeConte (Coleoptera: Alleculidae). Occasional Papers of the Biological Society of Nevada 15, 3pp. I suspect there are also specimens at UC Riverside, and LANHM. Jim Hogue has one specimen from San Diego which looks like the one in your photo (gracilis). Finally, Harsi's specimen doesn't look like what Schaeffer described as robustus. It might be either a form of cyanescens or gracilis. I should get the Marshall paper soon, or perhaps one of you will. I've put the links to the type photos on the genus INFO page. AHA! (well, at least more info.) - H.C. Fall reported in 1901 (Cal. Acad. Sci. Occ. Papers 8) that he had not been able to separate specimens taken in Pomona & Pasadena, & that they could be either gracilis or cyanescens. He also noted that males usually had red colored legs, females had black legs, & thus leg color not being a specific character. So, Harsi's beetle seems to be a female. Thanks for all the details Hartmut! Now I'm very curious about the Marshall paper. It's in the BioSciences library upstairs from my office so if nothing goes wrong I'll try to look it up tomorrow. I'm starting to think gracilis and cyanescens are the same species.... it should be interesting to see on what basis Marshall separates the species. The Marshall paper is only 3 pp. long. I ordered it through inter-library loan, but never know when that arrives. There seems to be some difference in the shape & length of the antennomeres. I just shake my head when reading some of those early descriptions. So little substance. This includes LeConte's 1851 description of gracilis. Joyce, Harmtut... you guys are the best! I'm learning so much more than I thought I would, and it sounds like between the two of you we'll all know the contents of the Marshall paper before long. I found the data on leg color really fascinating. I recall that when I first saw Joyce's images and thought they were a good match with mine, I had wondered if it was possible that the leg color was variable... Hartmut, I may have other more useful images showing antennomere detail if that turns out to be a critical factor -- let me know. S. gracilis - "color with a bluish, somewhat metallic sheen; basal three-fourths of femora usually red, rarely piceous throughout"
S. cyanescens - "color dull black throughout; legs black or brown"
All this is in agreement with how I perceived that Marshall sorted out the Essig specimens. However, in cases where gracilis had black legs and less of a blue sheen, they looked a lot like the cyanescens specimens. Marshall's 1967 paper also says that cyanescens "is a species of the northern part of the state" which is not in agreement with museum specimen identifications (even his at Essig -- unless Tulare County can be considered northern California). I don't know ... are gracilis and cyanescens really separate species? ps. I emailed a PDF of the paper to Harsi, Hartmut, V, and Blaine. Thank you so much, Joyce, for e-mailing me a copy of the paper. It was very thoughtful of you! Sadly, I agree with Hartmut that Marshall's paper did not really answer all (any?) of the questions we've been raising. I would be fine with my images being placed under cyanescens, as the specimen does seem to follow that species' general criteria most closely. However, I also feel more than comfortable with simply leaving my images at genus-level while waiting for Hartmut to check out his museum resources or for more info to come to light from some other avenue. Regarding distribution of cyanescens, Marshall writes "for the most part, a northern California species...". This would include specimens collected in SoCal. After all, the type was collected at Fort Tejon! Marshall does not deal with a number of things, i.e. Fall's observations about certain gender differences in specimens from Pomona and Pasadena. Also, he gives no record of the specimens examined. This paper did not remove, or even deal with the ambiguities in separating gracilis and cyanescens. Joyce asks a very good question, "are gracilis and cyanescens really separate species?". For now, I suggest to put this under cyanescens. By early January I'll be going to both UC Riverside, and LA NHM & will include looking for specimens of this genus. It's ok with me to either put this under cyanescens ... or leave it at the genus level for now. I'm very curious to know what you find at UCR and the LA NHM. Yes, there are a lot of ambiguities remaining about this genus! e.g. CO1 (cytochrome c oxidase subunit 1) as has been done in DNA-barcoding, would be helpful. Meanwhile, I don't know which way to lean - making bread right now, & no entomophagy involved - leave it at genus level or under cyanescens with a note on the genus page describing the ambiguities. I think I'd like to wait until seeing what's at UCR, etc. Ambiguotype. 1. A type specimen, usually a holotype, with inadequate date-locality labels. Classics are: "N.Amer. ", "Northwest Territory", "my backyard", "Summer 69", "Highway 313", etc. 2. Also known in some circles as a "Walker description" or as a "Walker type". Atypicotype. Type specimen of a new species ultimately recognized as a color variant of a well known common species. Coleopterists familiar with the work of Casey are well acquainted with this type of concept. Marshall, J.D. 1967b. Synopsis of Stenochidus LeConte (Coleoptera, Alleculidae). Occasional Papers of the Biological Society of Nevada 15, 3 pp. My most sincere thanks, Joyce, for the efforts you've made to research this issue and the added data you've provided. Hartmut has shared a few further interesting points with me via personal communication and perhaps I can convince him to share them here as well... Regarding range, the CA Beetle Project does list records for S. cyanescens from both Pomona and Pasadena which are relatively near my location (though I note that this site does not list any actual specimens in the holdings at SBMNH from this area).